It is widely recognised that tourism has the potential to help South Africa and other African countries grow their economies and create jobs. Tourism is contributing for around 9% of South Africa's gross domestic product, a growth to the economy of R412.5bn in 2017, which translates into 1.5 million jobs or 9.5% of total employment. By 2028, it is estimated that almost 2.1 million South African jobs will depend on tourism. Similar scenarios are playing out across many other African economies. However, ensuring a growing tourism sector will mean constantly assessing fast-moving technological developments that have the potential to change expectations, and create new opportunities—or might not come to fruition. In time, it’s possible that driving itself will be outdated, and faces and fingerprints will replace passports altogether. Today, however, we are still journeying to that future world. The next few years will be an exciting time for travel technology as advancements made in the past decade begin to scale up and make network-wide impacts. Here are some advancements and new experiences travellers should expect to add to their adventures, and that tourism operators should be considering. While nobody can yet say with confidence how autonomous vehicles (AVs) will be deployed at scale and within open context, it is certain that AVs can work in dedicated areas to transform carefully chosen tourist activities in an environment-friendly way. 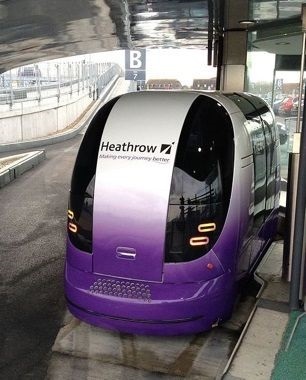 Heathrow Airport in London has the proof. Its self-driving shuttles have been running on dedicated roadways since 2011. Airport officials told the BBC in 2014 that they replace an estimated 70,000 bus journeys each year. The pods also complete their journey faster than buses while reducing carbon emissions by 50% as compared with typical airport shuttle buses, and by 70% as compared with individuals in cars. Here in South Africa, the potential for AVs to improve certain tourist experiences is very much on the radar. The non-profit Mobility Centre for Africa was set to run South Africa’s first public AV trials. This will begin showing the many ways in which these vehicles could be used to transform tourism. Examples include linking the Sandton Gautrain station with other local destinations, running along Durban’s famous beach front, or connecting Cape Town’s V&A Waterfront with the convention centre and CBD. Getting through airports is consistently ranked as one of the top stressors for travellers, along with money and safety. Thankfully, biometric security technology is having the rare effect of making airports more secure while also making airport processes more convenient. Some systems use automated document readers to check the electronic signatures embedded in authentic, government-issued IDs. Then, facial recognition is used to compare the document photo to the actual person. These steps let the system simply answer "yes" or "no" to the question "does this traveller match their ID, is it authentic and were they expected to travel today?" South Africa is set to automate its border-control processes for citizens using fingerprints stored in the Home Affairs National Identification System, or HANIS. A joint project by the Airports Company of South Africa and the Department of Home Affairs will see biometric scanning introduced at Cape Town International in March 2019, with OR Tambo and King Shaka following suit thereafter. A programme for international travellers, Trusted Traveller, will also be developed in time. Believe it or not, rental car companies may soon offer travellers the easiest access to the latest travel technology. In the United States, they’re the largest buyers of new cars, replacing the vast majority of their fleets – millions of cars – each year with newer, more connected models. This trend is likely to affect many markets in which car hire is widely used. Today, travellers can at least expect Bluetooth connectivity, even in budget options, but rental companies are quickly expanding their connected service offerings. As larger infotainment systems trickle down to the smaller models that become rental companies' budget options, new connected services like in-car payments for parking, tolls, fuel or even your morning latte will be available for any traveller. Technology comforts are expanding outside the cockpit too. To compete with rideshare services, rental car companies are moving more of the rental process to mobile platforms and are even starting to deliver car keys to driver’s phones. And while it’s still early days for autonomous cars, rental companies’ expertise in fleet management could make them an integral part of new mobility’s future. For many people it’s quite likely the first driverless car they ride in will be dispatched by one of today’s rental giants. Inter-city subways and flying cars are on the horizon, but travel and mobility won’t change all that drastically for several more years. In the meantime, the tourism industry in South Africa and Africa must lead the way in pioneering travel technologies that make sense for their markets—and travellers should enjoy the journey and join in the live testing of technologies that empower personal mobility and keep us all safe on our way.